Congratulations! You are now the proud owner of a fully assembled Saw Bench Synthesizer, or you assembled it yourself. Either way, you should be ready to use it now. This manual explains how. The back side of the Sawbench: MIDI in and power jacks. The left side of the Sawbench: the phono jack (audio out). 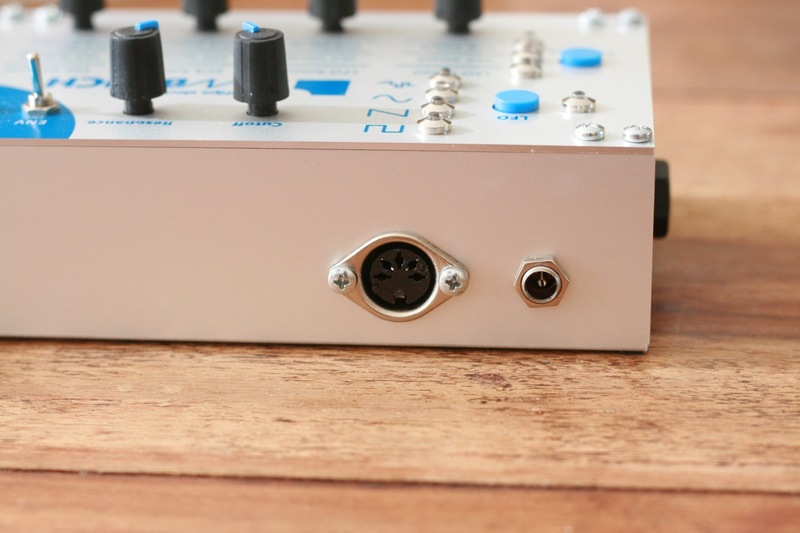 Hook MIDI out of your MIDI device up to the DIN-5 port on the back side of the Sawbench. A MIDI controller or keyboard are preferred for the first quick test. Hook up Audio output using the 6.35 mm phono jack on the left side of the Sawbench. This can be either a mixer or an amplifier. Be sure to turn it up a little. The Sawbench requires a suitable DC power supply like specified above. Hook it up to the power jack on the back side. NOTE: Supply plug must be center-positive. wrong polarity may result in permanent damage to the internal regulator! If everything’s right the Sawbench should show a little introduction: It should start scrolling through the LEDs faster and faster, and eventually they will stop and settle. Then, after one second, the LFO LED should start pulsing. This means the Sawbench has calibrated its VCO and is now ready to receive MIDI input! Now that the Sawbench is up and running, it’s time to make some sounds! Photo of the Sawbench from the top. Knobs and toggles set to “factory default”. The knobs are the usual type: turned completely to the left means it’s off or closed or zero, while completely turned up the right means it’s maximum. As you can see there are cutoff and resonance controls on the top. Just turn the cutoff completely to the right (what we like to call “open”), which means the filter cutoff is at maximum and hence will not filter out any frequencies from the sound. I.e. you will actually be able to hear notes! Wow! In the same way, you can set VCA Attack (the bottom-left knob) to zero. Set VCA Sustain (again a knob in the bottom row, the one just left of the rightmost) to full. See the picture above if you’re lazy and don’t like to read.. These settings are also how the Sawbench is configured in the factory. Then.. hit a key on your MIDI controller.. And you should be hearing notes play. How nice! If you don’t: feel free to visit the Forum or write us an e-mail at tastychipselectronics@gmail.com. Not a bad start.. now for the rest. Now for a more detailed overview. Below you find the a schematic of the signal path. Simplified block diagram of the Sawbench’s signal path. The VCO on the Sawbench is a Sawtooth oscillator. The pitch is controlled by MIDI (note on + pitch bend). There is also an option to add Frequency modulation using MIDI : modulation wheel + CC. All synthesis starts with oscillation. In this case we have just one true analog VCO which can generate just one type of wave: the sawtooth. The sawtooth is ideal for filtering, as it has many harmonics. As you have already found out the VCO pitch is controlled via MIDI note on/note off and may also be influenced by several other MIDI commands: pitch bend, modulation wheel and glide. The modulation wheel controls Frequency Modulation (FM). FM may be used to generate a whole range of sound effects: growling bass, overdrive-like effects, and oldschool telephone type sounds. The VCF cutoff and resonance knobs. The VCF on the Sawbench is a four pole diode ladder low-pass VCF. After the VCO has created a sawtooth wave at the desired pitch, this signal is then filtered by the Voltage Controlled Filter (VCF). The filter for a large part defines the character of the sound. Since the sawtooth has so much harmonics, a slight change in cutoff frequency is immediately noticed. The VCF is a 4-pole diode ladder filter with high resonance. The diode ladder has the characteristic sound of the classic EMS or 303 synths. Resonance may be used to make it squeel or whistle. The VCF is controlled primarily by the on-board (manual) controls of the Sawbench. This includes manual cutoff, manual resonance, Low Frequency Oscillation (LFO) and envelope controls. The VCF also has keyboard pitch tracking, which can be influenced via MIDI (see MIDI CC table at the end). Overall, the VCF has a large amount of controls for filter sweeps. The typical wawa and slapped bass sounds are of course possible, but utilizing looped envelopes quite crazy drones can be made as well. To top it all of, it’s possible to turn off filter envelope sweeps when playing legato (that is, glueing together of notes). See the section about ADSR envelopes further on. 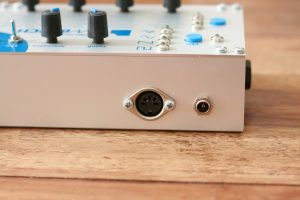 The VCA is an amplifier controlled by envelope 1 and by MIDI velocity. The VCA is an analogue amplifier based on the LM13700. This allows for a high dynamic range (80 dB) and good linearity. Note that the VCA envelope can also be looped. For more information see the envelope section further on in this manual. 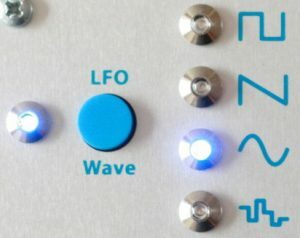 The LFO can be turned on/off by the LFO toggle switch. The LFO now modulates the VCF cut-off. The LFO is now bypassed. The Sawbench toggles: used to enabled or disable VCF controls LFO and envelope. Different waveforms can be selected using the wave select button. The frequency and amount of the LFO can be set manually. See the “Function” button explanation for more info. There are 2 Envelopes on the Sawbench. Both envelopes are triggered by MIDI note on information. They are scaled by MIDI velocity and the amount knob in state 3. The envelope uses the classic ADSR (Attack Decay Sustain Release) model. ADSR envelopes on Wikipedia. The knobs at the bottom of the Sawbench (TODO: picture) individually control the ADSR parameters. The ADSR knobs and their functions. Envelope controls use a cubic function. We feel it’s better than an exponential function, as it allows for smoothness through the entire range of operation. This applies for the manual controls (knobs) as well as MIDI. This envelope controls the amplitude of the VCA. 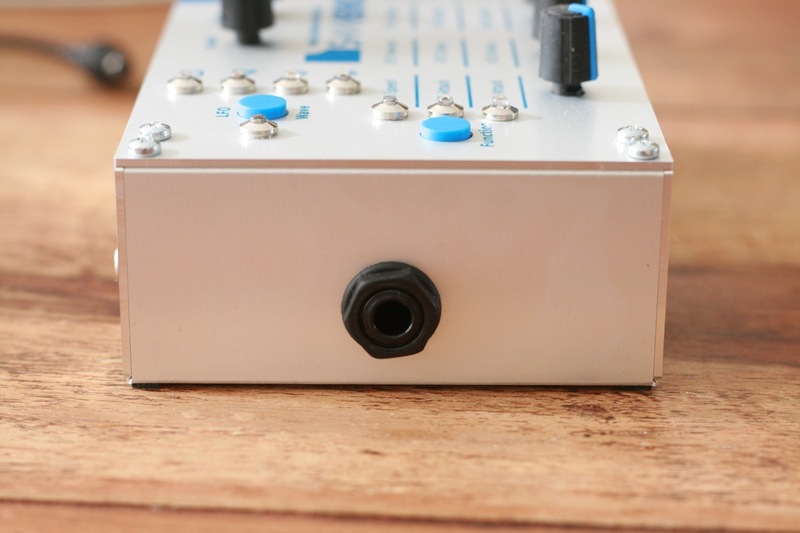 See the “Function button” explanation for more info on how to control ADSR + amount. 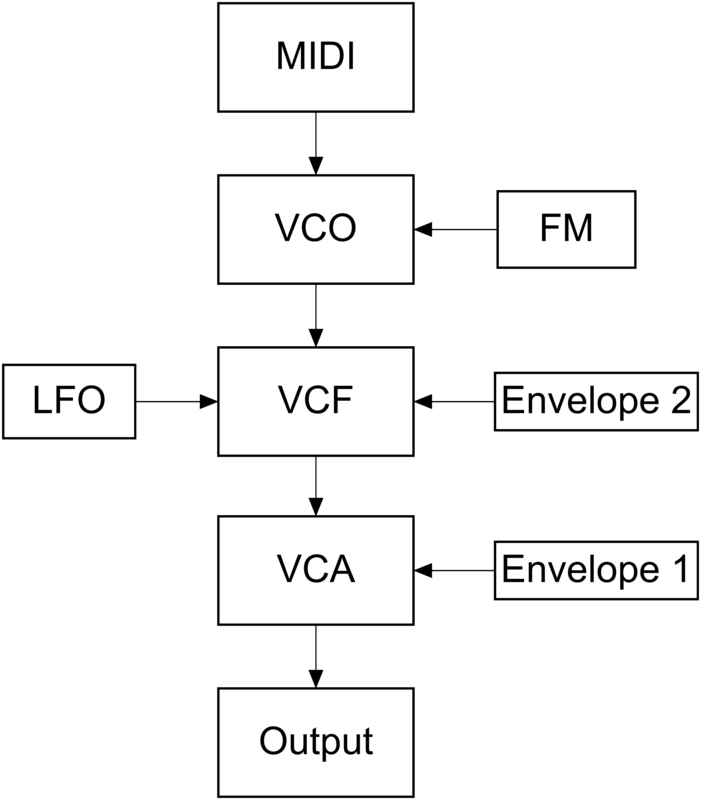 This envelope modulates the Cut-off of the VCF. You can bypass this using the ADSR toggle switch. See the “Function button” explanation for more info on how to control ADSR + amount. Envelope 2 can be kept on its sustain when multiple notes after played (glued) after eachother. See the legato MIDI CC in the table below. Note that both envelopes can be set to looping mode by using a MIDI CC (see table below). The Function button can scroll trough different states. The 3 LED’s next to this button indicate which state is selected. 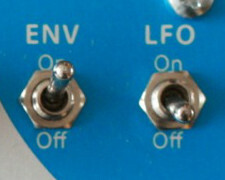 The 4 rotary knobs have different functions in each state (see pictures and table below). 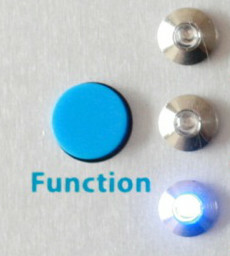 The function button and its three state LEDs. While it’s true that there’s no filter cutoff CC, there is a VCF keyboard tracking CC. This will also effectively shift the cutoff frequency, only in a relative way. Try it! While running an automated live setup: It’s probably a good idea to control a single “Function” on the Sawbench itself manually, for instance the VCA envelope.. and leave the MIDI sequencer to do LFO speed/depth and VCF envelope parameters. Frequency modulation can be a tricky beast. To get it to growl correctly it might be necessary to play around with the relative modulation frequency (CC 12). 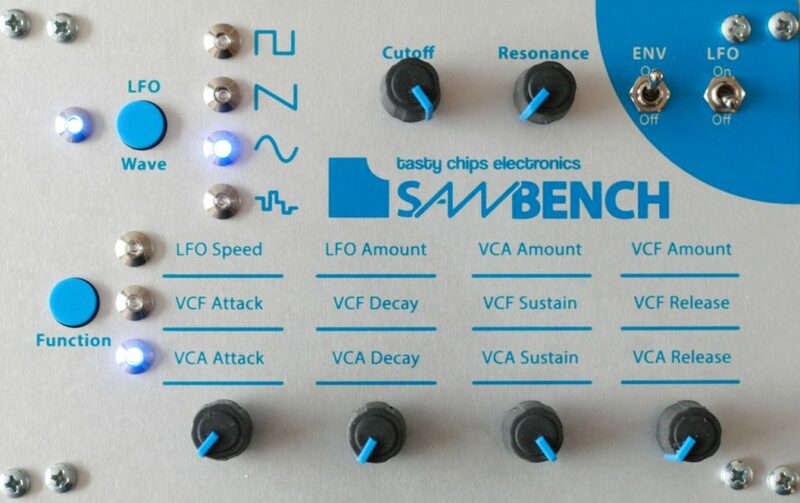 Not all Sawbench VCO’s are identical, due to small variations in the analog circuitry. Some may be digitally tuned higher or lower and the FM system is unaware of this, so may need some tuning over MIDI. This tuning can also be used to make it growl in lower or in higher octaves, if you like. The glide CC may be used to achieve the typical TB303 acid sound or sliding bass effect. Firmware v1.0 is known to have serious MIDI problems, especially with high data rates. Version 1.1 solved this problem, but still it didn’t support MIDI clock commands. Version 1.2 does support them. In case of missing notes gone missing: please upgrade. We supply sawbench microcontroller chips with the latest firmware in our shop MCU with latest firmware, or you can use the Arduino IDE and upload the code yourself: Sawbench firmware on Github.